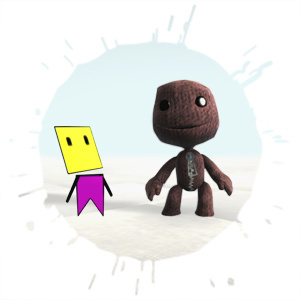 Back in 2006, When Alex, Mark and Dave pitched LittleBigPlanet to Sony, the loveable bag of fluff we all know as Sackboy was nothing more than debug programmer art - a little pink square body and a triangular yellow head, aptly called YellowHead. Even at that early stage the character that would become Sackboy had started to emerge, but how did he evolve from that set of simple shapes into the Sackboy we all know and love? It’s been two years this week since LittleBigPlanet was released, what better time than this could there be to find out? “He had a lot of personality, even then” reflects Kareem, as he, Francis and I glance at some concept artwork and look back to the early days of the now iconic character’s origins. YellowHead was very much placeholder programmer art created by Dave for the first playable CraftWorld code which was taken up to Sony on that fateful day of the pitch. But although he was merely a stand in, he ended up dictating the proportions of Sackboy, and the things he would need to be able to do. After the team got the go ahead to develop the game, the character needed to evolve into a proper character to fit the game’s developing art style, and so Mark, Francis and Kareem all went to the drawing board and started to concept. For quite some time the character was still called YellowHead and indeed kept the yellow head after which he was named. 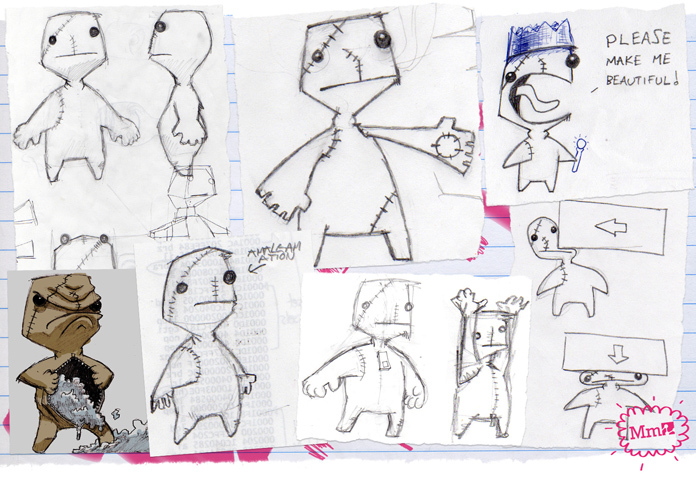 As Sackboy was reshaped time and time again, it was these handmade aspects that stayed true throughout everyone’s designs. There were three distinct versions of Sackboy shape wise, but you could see the similarities between them too. Dave’s sketches show the arrival of the trapezium head, the attitude, and the wrinkles in the cloth from his expressions. These tiny things were a huge influence on the final design. 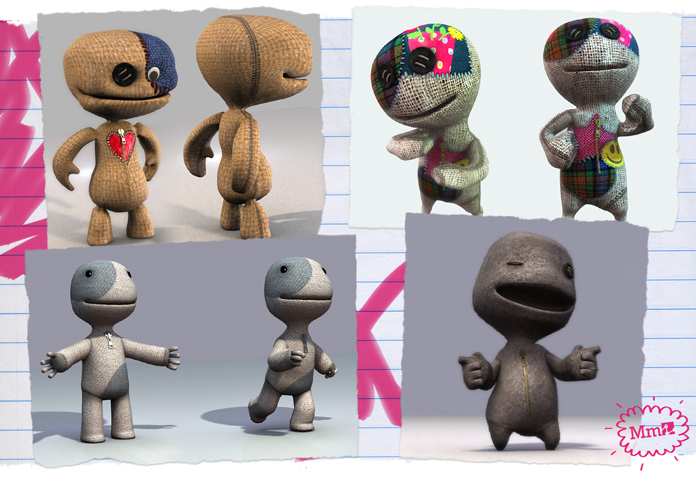 By now, one of the most distinct features of Sackboy was prevalent throughout all the designs. The zip. These days it’s just a cute feature of the character, but it was not always just for show; once upon a time it had an important function. From this moment on, Francis took the wheel “we thrust all these designs into his lap and said - ‘make it cool!’” Francis looks bemused, and shakes his head. Sackboy evolved into a very familiar shape, but his legs were still very much from the abstract design by Mark, short and pointy. It was the animation of Sackboy that would help to give him more character. Animations which evolved only when the designers started making levels and people started seeing him in different situations. “From day one he was grabbing and swinging, but for instance he looked strange as he swung about. Sackboy doesn’t need to build up momentum to swing forward, he just somehow creates energy from nothing, and the animation needed to support than.” The solution became the little peddling motion you see now. LittleBigPlanet features numerous lethal objects or materials to hinder Sackboy’s path, and each one required a unique animation to accompany it. Tom and Jerry would be the key inspiration for the animations that made the final cut, fairly violent, but whilst still feeling harmless and funny. But it very nearly wasn’t like that. All sorts of horrible ways for Sackboy to expire were created, some were way more extreme than others. “I really liked to describe the way his material behaved, so some of them involved his thread being caught and him unravelling, or his fluff spilling out everywhere. Glancing at the collection of sketches, I see Sackboy impaled on spikes, horribly squished or burned into a heap of ash. In the end the decision was made to make it a bit less gruesome, kick up the loveable, cute aspect. These seemingly small decisions were ultimately very important in defining the tone of both LittleBigPlanet and Sackboy as a character. I ask the guys about the challenges involved with building a character that needs to help define a game, and be infinitely customisable. As time has shown, the guys have done well. Sackboy is now adored by gajillions of people around the world, people inspired to play, create and share with him by their side. It’s true. Those who love Sackboy love all of his variations, they love to dress him up and customise him, even going way beyond the costume pieces made specifically for him, bolting on random objects and creating detailed stickers to paint him with. Others break out the knitting needles and set to work creating their own real life dolls. I ask Kareem and Francis about the effort and time people spend customising their Sackboys, and how key that aspect of the game now is. “I thought Sackboy customisation would be a side thing, not a key part of the game for anyone, not something people would play.” adds Francis. Through Download-able Content, and various free game updates, Sackboy is forever being enhanced, gaining new costume pieces or objects with which people can decorate him… but what’s next for our favourite little mascot? “There’s more to come for Sackboy, definitely, it’s very exciting - you’ll see him as you never saw him before…. say something like that.” smiles Kareem, and we all chuckle knowingly and head off to make some coffee. Of course at the time of the interview we were yet to announce LittleBigPlanet 2, so those knowing chuckles were mostly to do with all the new costumes and features from the new game, such as Sackbots. Still though, there are things you have yet to see, and lots to look forward to! In the mean time, let’s all say a big Happy Birthday to LittleBigPlanet, we celebrated with cake, and so should you! 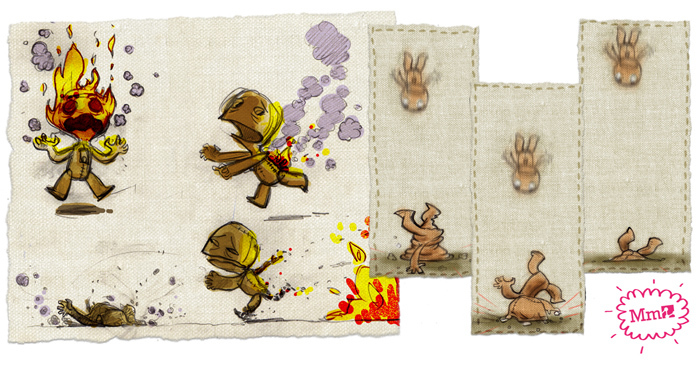 Be sure to check out more Sackboy concept artwork in our Flickr gallery.